Below (scroll) are several sketches of the works of George Inness and Asher B. Durand. Thumbnails of the paintings studied are inserted as links to a search of the Web for more information about the artists. A study in oils of an illustration by N.C. Wyeth ends this series. In one American room Catskill Mountains and The Storm by George Inness (1825-1894) were two strong examples of his Corotesque landscapes. An inheritor of the Hudson River School of painters, Swedenborgian Inness received little praise until after his death when critics hailed him a 'master of U. S. landscapists' quoted from a 1934 Time Magazine article about the Chicago Art Institute. Notice the circled numbers on the above study of Inness' Catskill Mountains. They are part of the original sketch as a reference to notes about the artist's techniques. The painting was done in 1870. 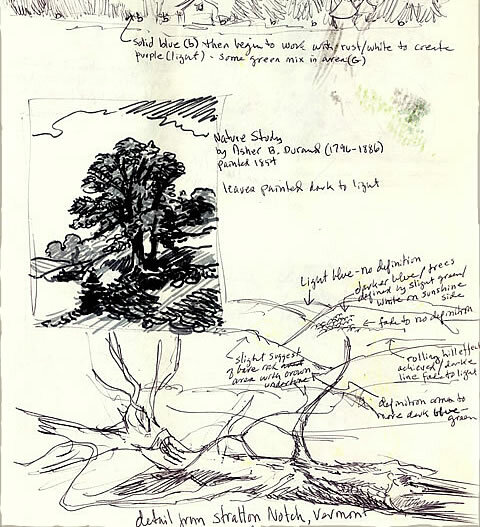 See the following for an indication of how artist Bob Glover made notes while sketching. The Inness painting below, Hackensack Meadows/Sunset, was studied at the New York Historical Society headquarters, May 1977. It was first done with colored felt-tip pens to quickly capture the layout of the painting. Sketches of details and notes were penciled in on other pages (one shown below with a couple done of Asher B. Durand's works. CLICK HERE for a thumbnail of the Durand painting Study from Nature, Stratton Notch, Vermont). 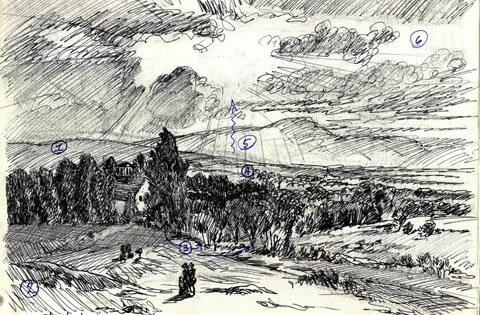 Two sketches above are studies of Asher B. Durand's artwork exhibited at the New York Historical Society in 1977. The picture shown here is of Study from Nature, Stratton Notch, Vermont. Notice that its the fallen tree in the foreground that's the focus of the bottom sketch. The 14" x 18" oil on canvas board below is a study of N. C. Wyeth's The children were playing at marriage by capture, 1911, an illustration for Growing UP by Gouverneur Morris, Harper's Monthly Magazine. 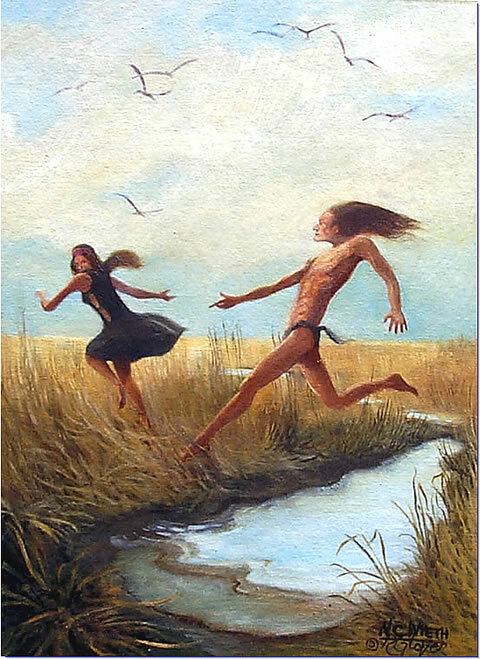 The entry page to the library lists a couple of books about Wyeth and his works owned by the artist. Also, the artist Bob Glover has opinions about where the great American illustrators of the 20th century will fit into art history and who some of them are. CLICK HERE for a website of the New York Historical Society's collection of artwork. Acknowledgement: http://www.the-athenaeum.org was the original source for viewing Catskill Mountains online. The thumbnail at the top of this page is a digital composition by the artist. Acknowledgement: http://www.oceansbridge.com is the source for the image of Inness' Hackensack Meadows, Sunset. The URL is linked to a file showing a lot thumbnails. Acknowledgement: http://www.thecityreview.com/durand.html is the source for the Durand thumbnail. The display of Study from Nature, Stratton Notch, Vermont is down the webpage.